This weekend we traveled to North Carolina for my bridal shower. 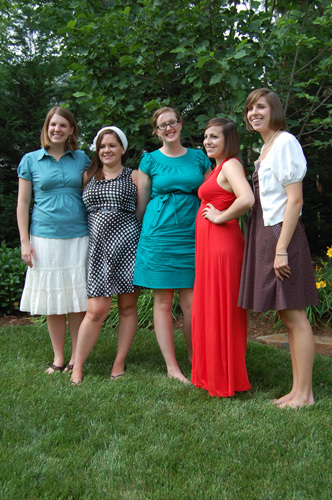 My bridesmaids are my sisters, Lauren and Genevieve, my cousin Mary Catherine, and my best friend, Megan. They’ve been planning and plotting for months and on Saturday they threw a beautiful, elegant, heartwarming shower. I couldn’t have wished for anything better and it made me feel so incredibly loved. I can’t wait for them to get married so that I can return the favor. In addition to the shower, Dan and I had a very full weekend. On Friday we had dinner with my mother, brothers, and grandparents (mangoritas and tuna tacos, anyone?). On Saturday before the shower, Dan’s parents joined my mother at her house for brunch. After the shower, Dan’s parents and his sister and niece came to my father and stepmother’s house for dinner, which made Saturday a very full day of family fun. When we arranged all of these gatherings a few weeks ago, I decided the least I could do was bring home some pie. I decided to make a banana cream pie for a few reasons. First of all, I love banana cream pie. 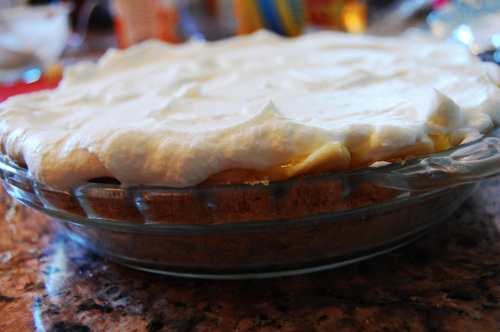 I am a banana pudding devotee, and banana cream pie is just as good and in some ways better. I also knew I wouldn’t have time before Saturday’s dinner to make anything, so I wanted something I could make ahead of time and freeze. 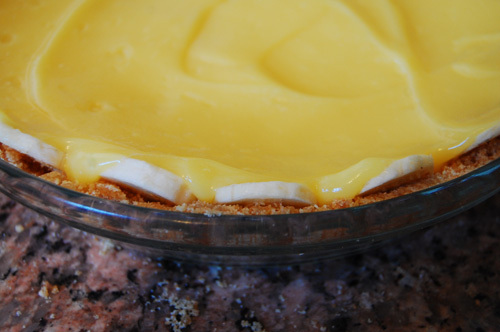 Because banana cream pies are no-bake pies they freeze incredibly well. Finally, I don’t think there’s anyone in our family that doesn’t like banana pie or pudding. I made it with a vanilla wafer crust (at Dan’s request), which turned out wonderfully. I didn’t have to add a lot of sugar to the mix because the wafers are so sweet, and the flavor was perfect. I used instant vanilla pudding because I was short on time, but if you are making scratch pudding, I have some recommendations. For one, the pudding should always be vanilla flavored in banana pies and puddings, never banana flavored. Also, people expect the pudding to be yellow, so a few drops of food coloring will make it the perfect color so that it looks just like banana pudding should. Start by making your crust. 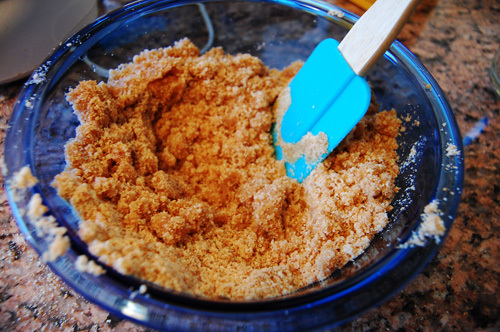 Combine wafers and 1/8 cup sugar in a food processor. Melt your butter, and toss. With crumb crusts like this you end up pressing your crust in. Don’t worry about it being flaky, the cooling process and the addition of pudding later will firm it up like magic. Press the mixture into the pie pan until the bottom and sides are fully coated and there are no holes. Refrigerate at least 1 hour. When your crust is nice and cool, go ahead and make your pudding. One box of pudding calls for 3 cups of cold milk, and you just whisk for two minutes. Let it set for about five minutes. 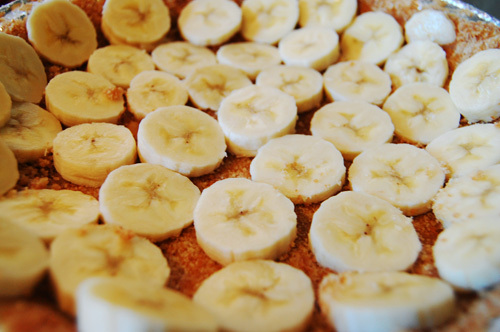 While it’s setting, slice bananas and line the pie crust with them. You want the whole pie to have bananas, even the sides, so don’t be shy. After you’ve done that, scoop the pudding into the dish and spread evenly over the bananas and crust. Whisk heavy cream, remaining sugar, and vanilla extract until stiff peaks form. 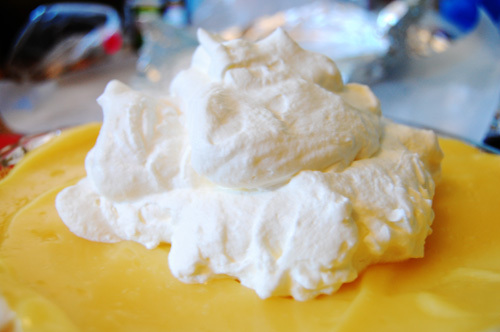 Scoop the whipped cream onto the top of the pie and spread it evenly. Refrigerate for at least 2 hours, and then serve. I just made a pudding cake and the instant banana pudding that I used calls for only 2 cups of milk. Is that a mistake in your recipe or are you using a bigger box of jello instant pudding mix? It’s possible I used a different type of boxed pudding than you used. I don’t specify Jello brand, so I would use the directions on your box. I want to try this pie, and make it ahead for an event on the weekend. I’m afraid of the bananas turning dark when frozen. Have you found this to be a problem? I haven’t tried to freeze this pie, but I imagine that the bananas will brown in the process.